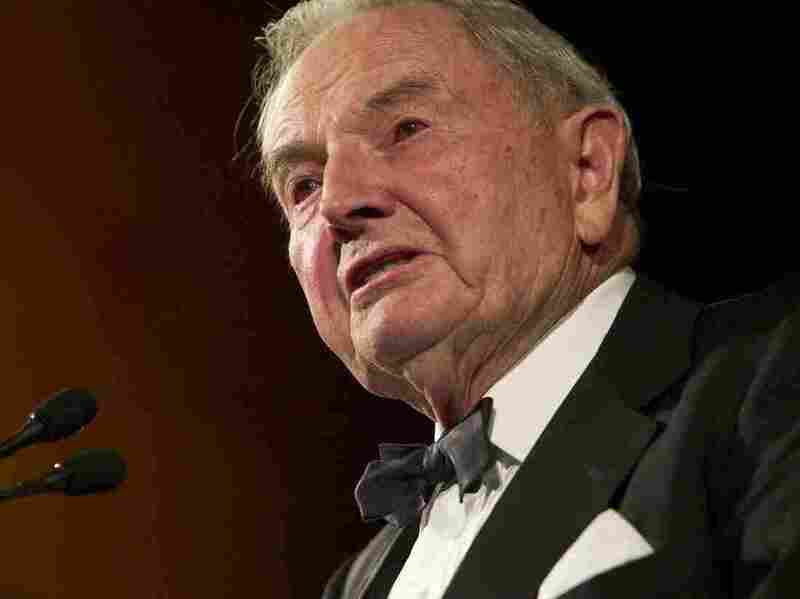 David Rockefeller — Philanthropist, Banker And Collector — Dies At 101 : The Two-Way The grandson of an oil baron, Rockefeller made his own name as the chief of Chase Manhattan Bank. But he was known nearly as well for his prodigious collections — of art, contacts and even beetles. 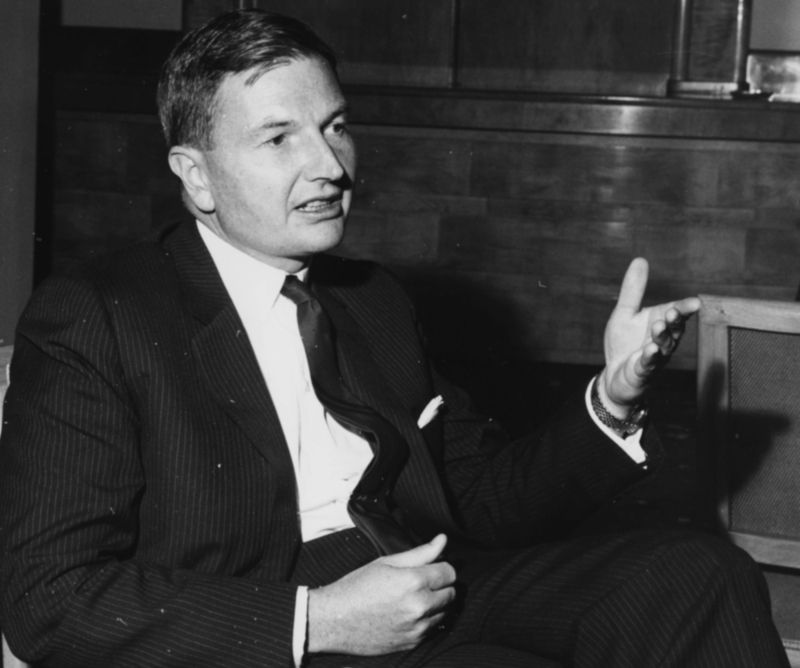 David Rockefeller, then chairman of Chase Manhattan Bank, speaks at the Chase Investment Forum in London in 1963. David Rockefeller, who died Monday morning at the age of 101, leaves a legacy that eludes a simple description. At once the grandchild and heir of oil tycoon John D. Rockefeller and a globe-trotting billionaire banker in his own right, Rockefeller also earned a reputation as a prodigious patron of the arts. Rockefeller died of congestive heart failure at his home in Pocantico Hills, N.Y., family spokesman Fraser P. Seitel confirmed to NPR. In a statement released Monday, former President George W. Bush commended Rockefeller as "one of the most generous philanthropists — and brightest Points of Light — whose caring and commitment to the widest range of worthy causes touched and lifted innumerable lives." At the time of his death, Forbes estimates, Rockefeller's net worth was $3.3 billion — a fortune he inherited and built upon as a longtime executive at Chase Manhattan Bank. For roughly two decades, according to the family's statement, Rockefeller occupied the lofty heights of the bank's management — serving as chairman of the board and co-chief executive beginning in 1961 and ultimately taking the reins as sole CEO in 1969. He would eventually step down from that position in 1980, retiring entirely about a year later. During that time, Rockefeller's leadership — and internationally oriented policies — became synonymous with Chase Manhattan, an institution so shaped by his reputation and vision it was occasionally tagged with the moniker "David's Bank." "Chase Manhattan grew from a $4.8 billion institution in 1946 when he joined to a bank with $76.2 billion in assets when he stepped down in April 1981. But it slipped from its standing then as No. 3 in the world and was purchased by Chemical Bank of New York in 1996. Today it is part of JPMorgan Chase & Co."
"From 1974 to 1976 its earnings fell 36 percent, while those of its biggest rivals — Bank of America, Citibank, Manufacturers Hanover and J.P. Morgan — rose 12 to 31 percent," the New York Times notes, adding that a scandal in the mid-1970s led the Federal Reserve and the comptroller to term Chase a "problem" bank. Rockefeller took an intensive interest in foreign relations during this time — again, for better and for worse. His frequent meetings with world leaders helped Chase Manhattan "become the first American bank with operations in those countries," says the Times. As he told NPR's Scott Simon in 2002, he even debated Soviet leader Nikita Khrushchev on the merits of capitalism in the mid-1960s. "It was quite fascinating," Rockefeller recalled. "We went at one another with strong views each on our own side, yet throughout I think we did respect one another and it was never a hostile debate." At the same time, he earned his fair share of bad press for meeting with dictators such as Iraq's Saddam Hussein, Chile's Augusto Pinochet and Cuba's Fidel Castro. In fact, it was partly on the basis of his and former Secretary of State Henry Kissinger's urging that President Jimmy Carter allowed the deposed Shah of Iran to enter the U.S. for medical treatment in 1979 — a decision that Bloomberg reports led to "the seizure of American hostages in Tehran from 1979 to 1981." Still, Rockefeller retained the respect of politicians from both sides of the U.S. political spectrum. As the Times reports, both Carter and President Richard Nixon asked him to serve as their Treasury secretary. He turned down both offers. He "would like to be thought of as having seen that there was an important role for the private sector in world affairs and cooperating with governments for the benefit of both sides," Rockefeller told the Times in 1995. David Rockefeller delivers remarks before presenting then-Secretary of State Colin Powell with the Marshall Award in 2003. "Other things which ... bring much greater satisfaction"
Despite his long tenure at the top of the banking world, Rockefeller crafted a legacy as much from his philanthropy as from his time in the office. To say that Rockefeller was well off while growing up would be a remarkable understatement. In his 2002 memoir, the first such autobiography to be published by a member of his family, Rockefeller recounted a gilded youth — one in which he delivered food to the poor with the help of a chauffeur, roller-skated along Fifth Avenue tailed by a limousine in case he should grow tired, and attended dinner with a father and mother who ate every night in their formal wear. But he said he also aimed to emulate aspects of his grandfather, the founder of Standard Oil — a man who "along with Andrew Carnegie, [was] the father of philanthropy in this country," he told NPR — and his mother, Abby Aldrich Rockefeller, who helped found New York City's Museum of Modern Art. David Rockefeller gave away nearly $2 billion in his lifetime, Reuters reports, and in 2010 he declared he would donate even more, signing a pledge with 39 other American billionaires to give at least half their wealth to charity during their lifetimes or after their death. On the occasion of his 100th birthday in 2015, the BBC reports, he donated 1,000 acres of land to the state of Maine. And he never forgot the institution his mother had a hand in creating, serving as its chairman for many years and leaving it a $100 million bequest in 2005, according to the Times. As much as he gave, Rockefeller had nearly the same propensity for collecting. At one point, his private art collection was valued at $500 million, and his famously vast collection of contacts — which the Times says had roughly 150,000 names in it — needed a whole room to house it. Still, his longest-running collection was significantly less ostentatious: his beetle collection. From a young age until his death, the unlikely amateur entomologist avidly collected just about as many beetles as he could find. "It's nice to live well and eat well and own things, but there comes a time, if you have enough money, when you just can't enjoy them all," Rockefeller told NPR in 2002. "And there are other things which I think can bring much greater satisfaction — and that's doing things for others."